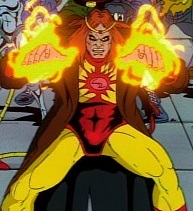 Powers/Abilities: Solarr was a mutant who could absorb solar energy and heat into his air and redirect it, usually through outward projection as blasts. History: (X-Men: The Animated Series cartoon episode, "Secrets, Not Long Buried" (fb) - BTS) - Looking for a place to hide, Solarr and his allies Chet Lambert and Toad took up residence in the pro-mutant town of Skull Mesa, soon taking it over when they learned of its underground goldmine. 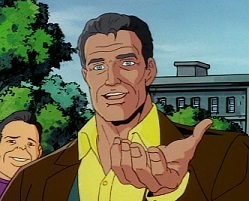 When Dr. Taylor Prescott, former mentor to mutants Andrew, Nicole and even the X-Men's Cyclops, alone opposed Solarr's takeover, Solarr had him placed in suspended animation and soon had all of the town's residents living in fear by attacking anyone who questioned his authority, forcing some of them to work in the gold mine and others such as Watchdog on guard duty for any outsiders getting too close. At some point, he had a statue built in his honor at the center of town. (X-Men: The Animated Series cartoon episode, "Secrets, Not Long Buried") - When Watchdog reported the arrival of the X-Men's Cyclops, who had images of Skull Mesa's founder Dr. Taylor Prescott in his mind, Solarr at first asked if Cyclops was a mutant before deciding it didn't matter and ordered Watchdog to take Cyclops down. When Cyclops survived and began investigating Skull Mesa looking for Dr. Prescott, Solarr and his allies confronted Cyclops. Introducing himself and feigning an interest in helping Cyclops, Solarr remarked that he had heard Cyclops' plane had trouble and that he'd get Cyclops to the local gas station for a rental that would have Cyclops out of town in no time. He also claimed he had heard Cyclops had suffered a nasty head injury and remarked that there was no hospitals in Skull Mesa, somewhat threateningly suggesting Cyclops head back to the city for a city doctor. When Cyclops asked about Dr. Prescott, Solarr claimed Dr. Prescott had moved into town and immediately back out, prompting Cyclops to suspect Solarr knew more than he was saying. Cyclops then asked where Dr. Prescott's home was and Solarr explained that investigating it would be a waste of time but Cyclops decided to check it out anyway. As Cyclops left, Solarr told his allies that he believed Cyclops had worn out his welcome. A short time later, Solarr and his lackeys found Cyclops threatening Dr. Darrell Tanak and demanding to know what had happened to Dr. Prescott. Announcing that Dr. Tanaka would not tell Cyclops anything because he didn't want Dr. Tanaka to, Solarr had Toad trap Cyclops in slime and remarked that Cyclops should have left Skull Mesa when he had the chance. Solarr then led Cyclops underground, where he showed Cyclops Dr. Prescott, who was in suspended animation. Revealing that Dr. Prescott had been stupid enough to oppose him, Solarr explained that the next day, Cyclops would be an example to anyone who opposed him. When Cyclops warned that his friends would come looking for him if he didn't return, Solarr sarcastically revealed that they would just tell them that Cyclops' plane crashed and that they had tried to help. Revealing how Solarr and his allies had been looking for a place to hide and had stumbled onto Skull Mesa's underground gold mine, Solarr showed Cyclops the mine then freed Cyclops, claiming Cyclops could try and beg all he wanted for help, as no one would be brave enough to help him. Later, Solarr confronted Cyclops in the Skull Mesa town square after Cyclops had failed to rally any help against Solarr and when Cyclops insisted that his friends would hunt Solarr to the ends of the Earth, Solarr uncaringly replied that the town's gold mine would make him rich enough to buy armies and that no one could touch him in Skull Mesa. He then ordered Chet Lambert and Toad to take Cyclops into the center of town to make an example of him. He then gathered the townspeople together, announcing that he had long warned of subversives wishing to destroy their lives. Announcing Cyclops to one of these subversives, Solarr lied to the townspeople, explaining that a crystal sculpture Cyclops was carrying was actually a transmitter used to summon his friends. When Cyclops insisted Solarr was lying, a confidant Solarr explained that the townspeople wouldn't listen to him but when Solarr prepared to kill Cyclops, Tusk attacked Solarr and freed Cyclops. Unfortunately, Solarr had absorbed enough solar energy to blast both Tusk and Cyclops. Solarr's attack was halted by the Lady Gardener, who grew trees to block Solarr's blasts. When Solarr set the trees ablaze, Solarr denounced the attacking townsfolk as traitors but Cyclops downed the townsfolk loyal to Solarr by hurling a crystal sculpture into the air and directing his optic blasts in multiple directions through it. Solarr responded by harnessing the heat from the fires in an attempt to burn the town to the ground but he was quickly hit by one of Cyclops' optic blasts. Cyclops then put out the fires and hit a returning Solarr, knocking him back before Lady Gardener used her plant growth abilities to capture Solarr with shrubbery. A returning Dr. Taylor Prescott suggested to Cyclops that Solarr and his men remained in Skull Mesa custody and Tusk destroyed the statue of Solarr in the town center. Comments: Created by Mark Onspaugh and AKOM Productions (see Appearances list for full list of artists). 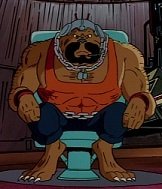 Watchdog's appearance resembled that of a humanoid Lockjaw, of the Inhumans. Despite a few online sources referring to her as Lady Gardener, I could not find a spot in the episode where she is identified. In an effort to still cover her and differentiate her from other mutants in Skull Mesa, I've chose to also call her Lady Gardener. If someone is able to point out where in the episode she called that or any other name, please let me know and I'll gladly update the profile accordingly. Similarly, I've seen online where Solarr's trio of criminals were called "Children of the Shadow" yet I could find nowhere in the episode where they are called that. I chose to leave their gang unidentified as their grouping did not require a specific name. They could've just been working together. While never identified by name in the episode, the characters of Senyaka and Strobe were identified based on their Earth-616 counterparts. Solarr's physical height and weight are presumed to be the same as his Earth-616 counterpart, Solarr (Silas King). Andrew was a young mutant student of Dr. Taylor Prescott who was eventually brought to Professor X for teaching. Upon first meeting Xavier, Andrew displayed his powers by energizing a nearby houseplant, impressing Professor X and Cyclops but when his fellow student Nicole's crystal generating powers went out of control, forcing Cyclops to blast the crystal to halt its progress, Andrew ran back to Dr. Prescott, only to be reassured everything was ok by Professor X. After spending some time at Xavier's school, Andrew learned that Cyclops would be visiting Dr. Prescott and energized a crystal sculpture by Nicole to give to Dr. Prescott as a present. Andrew could energize non-living objects, causing them to glow with sparkling energy. Lady Gardener was a mutant resident of Skull Mesa, Nevada who had the hobby of gardening. Very suspicious of strangers after the mutant Solarr took over the town, Lady Gardener was shocked when Cyclops walked onto her property and commended her on her garden. Terrified, Lady Gardener ran inside as Solarr confronted Cyclops personally. Later, Cyclops visited Lady Gardener's home and attempted to speak to her against Solarr but the still fearful Lady Gardener asked Cyclops to leave, prompting laughter from Solarr's agents Chet Lambert and Toad. The next morning, when Solarr attempted to kill Cyclops, Lady Gardener witnessed fellow resident Tusk fighting back and she used her powers to instantly grow trees from the ground to block Solarr's attack. When Cyclops defeated Solarr, Lady Gardener used her powers to manipulate nearby shrubbery to hold Solarr in captivity. She then watched as Watchdog returned with a weak Dr. Prescott, who was healed by Dr. Darrell Tanaka. Lady Gardener was a mutant with green skin and she could mentally stimulate plant growth. 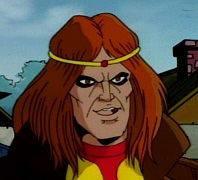 --X-Men: The Animated Series cartoon episode, "Secrets, Not Long Buried"
Chet Lambert was a member of Solarr's gang of mutant criminals alongside Toad. 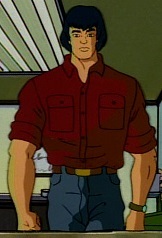 After taking over the mutant town of Skull Mesa, Chet remained one of Solarr's right-hand men and confronted the X-Men's Cyclops when Cyclops began investigating the town looking for Dr. Taylor Prescott. Chet later accompanied Solarr to the home of Dr. Darrell Tanaka, where Chet phased through the wall to pin Cyclops' arms behind his back. Chet then accompanied Solarr as he showed Cyclops the comatose Dr. Prescott and later phased through the ground at Skull Mesa resident Tusk's home as Cyclops was attempting to get Tusk to rally against Solarr and asked about the generator coil Tusk was working on repairing. He then warned Cyclops to let Tusk continue his work before threateningly asking how Tusk's family was. Later that evening, Chet accompanied Toad to laugh at Cyclops as he attempted to rally the mutant Lady Gardener against Solarr to no avail. As other townspeople shut their doors to Cyclops, Chet Lambert laughed and suggested Cyclops use a car to visit another town. When Lambert and Toad provoked Cyclops into attacking them, Chet goaded Cyclops, who rushed at Chet, only to pass right through his intangible form and hit the ground. The next morning, Chet remained by Solarr's side as Solarr confronted Cyclops and was ordered to take Cyclops into the center of town. Cyclops valiantly tried to fight back but proved no match for the intangible Chet Lambert, who knocked Cyclops with a punch. He then took Cyclops to the center of town as ordered and remained by Solarr's side as Solarr publicly denounced Cyclops as a subversive that had to be dealt with. Some of the townspeople turned against Solarr, however, when Solarr prepared to kill Cyclops and during the fight, Chet Lambert knocked out Dr. Darrell Tanaka when Dr. Tanaka restored Cyclops' mutant powers but he was quickly downed by Cyclops' returned optic blasts. When Chet came to, he snuck up on Cyclops but was downed again by Toad, who accidentally hit Chet with a slimeball meant for Cyclops. Chet Lambert had the ability to become intangible, allowing him to phase through solid objects such as walls. Nicole was another of Dr. Taylor Prescott's former students. When Dr. Prescott brought Nicole to Professor Charles Xavier, Nicole impressed Xavier by generating a small crystal structure from the ground but soon lost control of her powers, causing the crystal to progress wildly and forcing Cyclops to blast the crystal to halt its progress. Scared of Cyclops' powers, Nicole ran back to Dr. Prescott but eventually decided to stay at Xavier's school for mutants. After learning to better control her powers, Nicole learned that Cyclops would be visiting Dr. Prescott and sculpted a statue of Dr. Prescott standing with fellow student Andrew and herself as a present for Dr. Prescott. Nicole could generate crystals at will. As a child, she had difficulty controlling her ability, sometimes uncontrollably generating crystals. 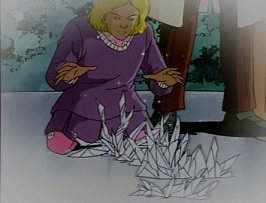 As an adult, she learned to better control her powers and could form the crystals into specific shapes, such as sculptures. Dr. Taylor Prescott was a friend of Professor X and Cyclops. Shortly after Scott Summers' mutant powers first manifested, Summers ran into Dr. Prescott while being chased by a group of kids after accidentally destroying a baseball with his mutant powers. Dr. Prescott explained to the boys about Scott's powers and reminded Scott that the boys were only scared of what they didn't understand. Some time later, after Scott had joined Professor X's X-Men, Dr. Prescott, who also hoped for a day in which mutants and humans could live in harmony, would occasionally bring young mutants to Professor X for teaching, often not accepting credit for the work he did in building a community between humans and mutants. Eventually moving to the all mutant town of Skull Mesa, Nevada, Dr. Prescott set up in the old Chandler home, befriending the townspeople, and invited Cyclops to visit. Discovering an underground gold mine, Dr. Prescott used it to help the town and keep it prosperous and sufficient for its townspeople until the criminal Solarr took over Skull Mesa. Dr. Prescott opposed him and was placed in suspended animation. Having not heard from Dr. Prescott in two weeks, Cyclops decided to investigate Dr. Prescott's disappearance, eventually finding the comatose Dr. Prescott when Solarr captured Cyclops. When Cyclops later battled Solarr, Watchdog saw where the town's events were heading and rescued Dr. Prescott, returning to the scene with a very weak Dr. Prescott shortly after Cyclops had defeated Solarr. Dr. Darrell Tanaka immediately used his powers to heal Dr. Prescott and Cyclops then presented Dr. Prescott with the sculpture made by Andrew and Nicole. With Skull Mesa now safe, Dr. Prescott asked Cyclops what they should do until Cyclops' friends arrived to pick him up and Cyclops suggested they catch up on old times. Senyaka was a resident of Skull Mesa, Nevada. He attended the town meeting held by Solarr about outsiders destroying their community. He presumably had the same energized whips that his Earth-616 counterpart had. Strobe was a resident of Skull Mesa, Nevada. She attended the town meeting held by the criminal Solarr about subversives seeking to disturb the town's community. Strobe presumably possessed the same light manipulating abilities that her Earth-616 counterpart had. Dr. Darrell Tanaka was a mutant doctor living in the town of Skull Mesa, Nevada. Unaware Solarr had ordered the telekinetic Watchdog to crash the plane of the X-Men's Cyclops, Dr. Tanaka drove past the hitchhiking Cyclops and picked him up. Admitting he didn't normally pick up strangers, Dr. Tanaka learned that Cyclops was on his way to Skull Mesa when his plane fell out of the sky. He then asked what Cyclops' business in Skull Mesa was, as the residents typically did not like strangers. When Dr. Tanaka and Cyclops arrived in Skull Mesa, many of the townspeople closed their doors and windows to Cyclops, proving Dr. Tanaka's point. Dr. Tanaka then brought Cyclops to his home/doctor's office, checking out Cyclops' banged head and explaining that he was Skull Mesa's only doctor/coroner. After giving Cyclops some tea and asking what other business he had in Skull Mesa, Dr. Tanaka was threatened by Cyclops, who was angry at being shot out of the sky. Demanding to know what was going on in Skull Mesa and why everyone was afraid, Cyclops explained that he was looking for Dr. Taylor Prescott and a very nervous Dr. Tanaka told Cyclops that he didn't realize Dr. Prescott still lived in Skull Mesa. Cyclops replied that Dr. Prescott lived there two weeks prior and decided to investigate Skull Mesa himself. Dr. Tanaka sadly watched as Cyclops stormed off. Following a run-in with the town's leader Solarr, Cyclops returned to Dr. Tanaka's home and demanded Dr. Tanaka's jeep and directions to the old Chandler home. A terrified Dr. Tanaka asked Cyclops to leave, claiming he couldn't be seen with Cyclops anymore, but Cyclops just took the jeep keys and left. Returning minutes after finding Dr. Prescott's home covered in slime, Cyclops demanded Dr. Tanaka tell him what had happened to Dr. Prescott and Dr. Tanaka insisted Cyclops couldn't help Dr. Prescott before Solarr arrived. After Solarr later freed Cyclops, knowing no one in town would help him, Cyclops returned to Dr. Tanaka's home, where Dr. Tanaka nursed Cyclops back to health and revealed that Dr. Prescott had attempted to help the town before Solarr took over. Revealing that only Dr. Prescott had attempted to stop Solarr during his takeover, Dr. Tanaka was chewed out by Cyclops but Tanaka explained that no one in town was a soldier and any who questioned Solarr's authority was never seen again. Cyclops then replied that the opposition was still alive and tried to get Dr. Tanaka to help stop Solarr but a reluctant and fearful Dr. Tanaka declined to help. Cyclops then angrily left, asking how Dr. Tanaka could call himself a doctor. When Solarr attempted to kill Cyclops at a town meeting the next morning, Dr. Tanaka witnessed fellow resident Tusk and Lady Gardener fighting back against Solarr and during the distraction, Dr. Tanaka used his own mutant healing powers to neutralize Watchdog's earlier telepathic prevention of Cyclops' access to his mutant powers. Unfortunately, Dr. Tanaka was knocked out by Chet Lambert and when he recovered, he saw the reformed Watchdog bring the weak Dr. Prescott to Cyclops. 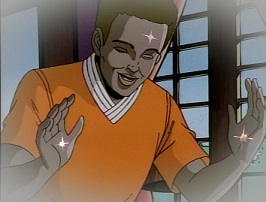 Dr. Tanaka immediately used his healing powers on Dr. Prescott, restoring Dr. Prescott's health. He then watched as Cyclops presented Dr. Prescott with the sculpture made by Prescott's former students Andrew and Nicole. Dr. Darrell Tanaka had the mutant ability to heal injuries via skin-to-skin contact. Watchdog was a mutant living in the pro-mutant community of Skull Mesa, where he was placed on guard duty after Solarr took over the town. When the X-Men's Cyclops approached the town, Watchdog sensed his arrival and reported it to Solarr, explaining that Cyclops had images of Dr. Taylor Prescott in his mind. After asking if Cyclops was a mutant or not, Solarr ordered Watchdog to take Cyclops down. Using his telekinesis, Watchdog forced Cyclops to crash and later turned against Solarr, rescuing Dr. Prescott while Cyclops battled Solarr. After the battle, Watchdog informed Cyclops that he had salvaged the radio equipment from Cyclops' plane and summoned Cyclops' friends to the scene. When Cyclops asked if Watchdog had a change of heart, Watchdog replied that it didn't take a genius to see where things in the town were going. He then watched as Dr. Darrell Tanaka healed Dr. Prescott and Dr. Prescott was presented with a sculpture made by two of his former students, Andrew and Nicole. Watchdog had vast telepathic and telekinetic abilities. His telepathy enabled to sense others from miles in the air, read their thoughts, prevent mental access to superhuman powers and even disable telephone signals across entire towns and his telekinesis was strong enough to force planes from the air. He also had a dog-like appearance.